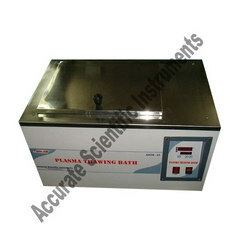 Micro controller based plasma Thawing Bath is a tabletop model, for quick thawing of plasma at 37°C. Audiovisual alarm to notify when temperature deviates from preset temperature, is fitted to the equipment. The Thawing Bath equipment displays set value & process value. Looking for Plasma Thawing Bath ?